"The staff here is very kind and helpful." Have a question for Alta City Pension? "The AC works fine and Internet is actually good (rare in Palawan)." "Central location and close to the airport." "Hot water from the water heater was a warm welcome after hav..."
Conveniently located in Palawan, Alta City Pension is a great base from which to explore this vibrant city. From here, guests can enjoy easy access to all that the lively city has to offer. Visitors to the hotel can take pleasure in touring the city's top attractions: NCCC Mall, Mendoza Park, Palawan Museum. Offering hotel guests superior services and a broad range of amenities, Alta City Pension is committed to ensuring that your stay is as comfortable as possible. The hotel provides free Wi-Fi in all rooms, 24-hour front desk, Wi-Fi in public areas, car hire, tours to ensure our guests the greatest comfort. In addition, all guestrooms feature a variety of comforts. Many rooms even provide television LCD/plasma screen, towels, internet access – wireless (complimentary), non smoking rooms, air conditioning to please the most discerning guest. The hotel offers wonderful recreational facilities such as massage, garden to make your stay truly unforgettable. Discover an engaging blend of professional service and a wide array of features at Alta City Pension. "It's rather clean, the staff was nice." Everything is good except the served breakfast. 100 pesos for breakfast is not worth it. Better eat at balinsasayaw restaurant for your breakfast at 69 pesos. This resto is just in front of the hotel. I enjoy my stay in Alta city pension. The staff's service is excellent especially for my roel, the manager of the alta city pension. All staffs are really helpful and have initiative even we had not asked that makes me really enjoy my stay and highly recommend this place. The location of the Alta city pension is also comfortable in the middle of the city and easy to roam around to have some food or night life in Palawan. last week, i stayed 6 days. it was center of puerto princesa, so very close to go anywhere, many restaurant. room was clean. and staff was kind. when i went to travel agency, dolphin watching and firefly watching was impossible to make a reservation. because we were only 2 person and wave was strong. but the pension staff made a reservation. they gave us a ride to firefly watching. It is located in an alley just off Rizal Avenue. Easy to find from the provided maps on website. The building is exactly as is shown here. The room was a typical budget room, a little depressing but it had aircon. I'm not surprised that they dont show photos of the room. They provide hot and cold water. It is quite difficult to cross the main road at this point, be very careful. There's no breakfast provided. It's main attraction is the central location. I have nothing to complain about the hotel itself. It's rather clean, the staff was nice. The AC works fine and Internet is actually good (rare in Palawan). However, there is a giant bar nearby, and the music went on (it was a Friday) until very late. We stayed in the aircon shared bathroom room with two twin beds. It was a very basic room. Central location and close to the airport. Less than a 10 minute walk to Ima's restaurant (great food!) Powerpoint hanging out of the wall. Walls really dirty. Shared bathroom could do with some TLC and an upgrade. We didn't really mind, but word of warning it was quite loud there- bars trying to outplay each other with music and the staff in the morning at 6 yelling in the hallways outside our door. We won't stay again. For value of money there are other places, such as Arnaldo's guesthouse that we found and stayed at the next time we were in Puerto. Great find. The location is excellent, being across from the Tiki bar/restaurant and one other club. I felt that I paid too much for these rooms. One can get much better elsewhere if one doesn't care to take a jeepney or trike. When a friend wanted to stay over night on the other bed, the hotel tried to charge for extra people, despite the fact my reservation was for two. The room was very basic but the staff was very accommodating. There was no in room safe. The Tiki bar across the street play very loud music but it was entertaining. Because this pension house is off of the main street, the traffic noise was muted. a nice clean room on a very nice location. close to restaurants and bars but in a little alley away from traffic and bar noices. the bed is good, the ac is good, wifi works, tv works and the breakfast is simple but good. breakfast is served at your room because no restaurant. the people are friendly and even served breakfast at 6 am. tickets for underground river were sold out. i enjoyed my stay over all. the place was clean enough, nice enough, and priced right. i could have done with a bigger bathroom, their bathroom was a quite small (which i noticed in most puerto hotels). the location was superb though!!!! i came to puerto for a business trip so it was nice for me to be able to walk to all the places that i needed to be. great places to dine and buy stuff. the staff were really nice and accommodating. all transportation passed by the hotel so it was easy for me to catch a ride going anywhere i wished. i cannot say enough good things about the location. despite being in the city center it was rather tucked away because it was in a cul-de-sac. if you are looking for value for money i'd say this is a good place to go. My mom and my son had a great time staying in this hotel. Staffs are very accommodating and willing to assist your every needs and requests. Delivery is allowed and they even assists delivery guy to find our room. They also informed you when your tour provider already confirmed time of pick up. They also allow us to check out as late as 1:00 PM without additional charge. Hotel furniture can be improved, like bigger dining table which we used when they deliver the breakfast every morning. Might be good as well to change the flat sheet to a thicker one or comforter perhaps. Easy to find and just minutes away via tricycle ride from airport. Fast food restaurants including Jollibee, Chowking, Shakeys and Greenwich is just walking distance from hotel and a convenience store is also available just steps away from hotel. Besides the Karaoke establishment nearby which is noisy at nights but bearable (for us), the hotel which is entirely for the use of rest and comfortable sleep at night, all in all its exactly what we need. It's my 3rd visit in Puerto Princesa City and in each visit I have different stories to tell. This time, I stayed in a low-budgeted hotel. But the comfort in sleeping was the same as the other two hotels I stayed before. Only this time, the hotel I stayed for 3 days is very much accessible to restaurants/coffee bars/diners/fastfoods, mall and banks, a few steps away literally. The staff are very friendly/accommodating (though of course, this is what business needed most). If In the near future and wish to come back for the 4th time, surely I will choose to stay in this hotel again. it's a budget hotel with comfortable room but only the blanket is too thin. The room condition is tide and clean. The hotel's staff also very helpful and friendly in giving info about the surroundings and attraction places to go with. Perfect place to crash in PP, free airport pickup, great knowledge about all the touristy stuff - super friendly and helpful in making sure you don't get ripped off with all the tour packages! We loved this place so much that we stayed here again on our way back from El Nido. It's definitely basic and simple, but good value - good airconditioning and showers. Highly recommended as decent budget traveller hotel. the stay was great. even if the hotel is on the busy rizal street, it feels quiet in the rooms. there is tv with lots of channels, enough space for luggage, comfortable beds, very well working air-condition. if you book standard room, you get breakfast included and you have your own bathroom. they also have budget rooms without private bathroom and without breakfast, but the shared bathroom gets celeaned all the time during the day, so this option is ok too. the hotel is like 7 mins drive from the airport, there is a convenience store next door, nightlife, great restaurants. the hotel seems to be new. the only thing which was bad was slow internet. We booked our room the night before and checked in without hassle. Alta City is pretty much how it describes itself. It's not the kind of place you will stay at for days because it is beautiful and charming. 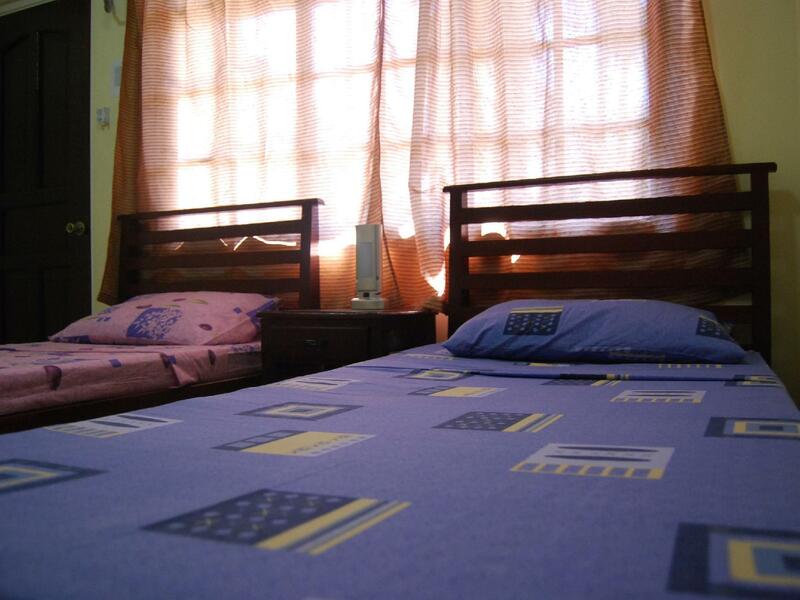 You will stay here because you need a room for a night or two and appreciates the convenience and basic comforts. The room and attached bathroom was clean and surprisingly spacious. Staff was very helpful with directions and places to go. Clean and spacious room. Room I booked have own bathroom. The staff are very nice. I stayed one night and then come back for another night after El Nido trip. They let me store my luggage and dropped my laundry at the laundry place when I was leaving El Nido. Free Wifi too. good location, and average breakfast! we chose this hotel because it was close to the airport. the location is ok, near the city centre, with lots of restaurants and shops around it! the room is not bad, it is enough for a noght in the town! i t is clean with hot water and breakfast.